“Tomorrowland” does not play by the usual ‘Disney PG movie’ rules. It hits harder, makes the audience uncomfortable, and has an alarmingly high body count. When we finally discover the movie’s endgame, this makes perfect sense, but it might be a shock up front to parents who see that the DreamWorks Animation movies are all PG, and therefore assume that “Tomorrowland” will be no different. It is drastically different – this film is a call to arms. It may take its name from a 60-year-old section of Disney World, but this movie is as right here, right now as it gets. And while the movie is undoubtedly better than it would have been without writer/director Brad Bird’s involvement, the fact of the matter is that this is Bird’s weakest film, but let’s put that into perspective. He directed three animated masterpieces in “The Iron Giant,” “The Incredibles” and “Ratatouille,” as well as the very good “Mission: Impossible – Ghost Protocol.” “Tomorrowland” is enjoyable; it just doesn’t measure up against Bird’s other films. It uses a jerky narrative device at the beginning that never works, and actually leaves the audience unprepared for what follows. It also has no business being 130 minutes long. Casey Newton (Britt Robertson) is a high school science prodigy who spends her free time sabotaging the NASA site where her father (Tim McGraw, yes, that Tim McGraw) works in an attempt to delay his eventual layoff. One night she gets caught and arrested, and while retrieving her things after getting released on bail, she finds a pendant that, when she touches it, briefly transports her to another world with technology that far exceeds our own. 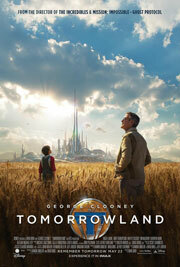 In her quest to discover what this place is, Casey gains the help of a girl named Athena (Raffey Cassidy), who leads her to Frank Walker (George Clooney), who has also visited “Tomorrowland” but was exiled. Frank reveals to Casey that something bad is coming, and nothing can stop it. Casey convinces the jaded Frank to believe that they can avoid the inevitable, but soon they have another problem: a group of “Secret Service agents” seek to permanently close the bridge between our world and Tomorrowland, with extreme prejudice.